Cats are by far New Zealand’s favourite pet, with an estimated 44% of homes having at least one. Dogs come in second place with 28% of homes having a furry friend. In terms of sheer numbers though, fish are the most populous! 10% of homes in New Zealand have fish, but each of those homes has an average of nine, meaning there are millions across New Zealand. These pets – just like ourselves – are prone to a host of illnesses and diseases. Depending upon the severity of the illness that they contract, this can cost thousands of dollars to remedy, and the veterinary bills can quickly pile up. Our pets are part of our family, and no person should have to worry about making those payments. This is why countless people across New Zealand (and the wider world!) choose to insure their pets against illness with Petplan. Petplan began in 1976 in the UK and in the decades since we have grown to become one of the most popular and trusted pet insurance providers worldwide. 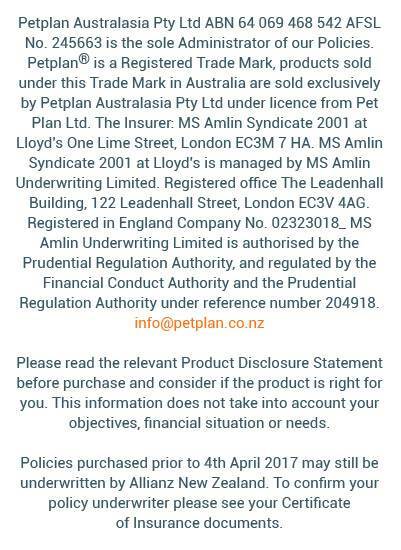 Our journey around the world began in 2004 when Doug and Gwen Ford secured naming rights to the business and created Petplan in Australia and New Zealand. Before securing these rights, the Fords were – and continue to be – heavily involved in the pet industry as a whole with a specific focus on the dog showing community. We believe that everybody should be able to insure their pet and that pursuing coverage shouldn’t break the bank. That’s why we offer transparent and competitive pricing that doesn’t sacrifice on quality. If you are interested in pursuing coverage with us, we have a simple online tool that can help you to generate a quote for your pet. You can also do it over the phone with one of our advisors! After you see our prices, we are confident that you’ll see the value that we offer. We even have special discounts for animal lovers, offering a multi-pet discount of 10% per pet, per year to those who insure three or more pets with us. When it comes to your precious pet, insurance for illness should never have to be a worry. Our policies are transparent and effective, and we offer a quick turnaround time on any claims that you might make. Keep your furry friends safe and protected, and keep yourself free from worry. We are the only provider on the market that offers truly lifetime coverage for your pets (as long as the policy is consistently maintained). This is difficult to find, and it’s one of the key reasons that people choose us over our competitors in the market. If your pet contracts an illness, pet insurance will be there to help you with any costs associated with treatment. Looking to insure a new pet or an old furry friend? Visit our website today to find out all the details about taking out a policy with us and please feel free to contact us if you have any questions or concerns.